Whoop! Let us give it up for another week of the wonderful One Room Challenge hosted by Linda from Calling it Home. I have not said much about this challenge in regards to how the game is played. Before I do so, I would like to say, “Thank You” to all of those who have commented and have been supporting me through this journey. It has been a crazy 3 weeks so far and I have yet to respond to all the comments, but please know I do appreciate you! Okay, for some odd reason I assumed everyone knows about the infamous One Room Challenge. Basically, Linda chooses 20 home decor bloggers to participate in this challenge and the other 200+ (me included) are linking participants. Throughout the 6 weeks we share how we tackle a room makeover–the good, the bad, and the ugly. Sometimes we finish, sometimes we do not. Most of us bloggers, try to participate in “real time.” Meaning what you see is literally all they are giving you at the moment and where they stand on their project. What you see from me is all in real time, what I have completed is what I have for you at the moment. I teased you last week and told you that I will share my fireplace plans with you this week. Well, I am happy to say, the fireplace is completed. I thought about doing a tutorial, but I changed my mind…I do NOT want to be held liable for anything. Please note, what I did to my rental fireplace works for me, it may not work for all rental fireplaces. This fireplace facade is something that can be knocked down prior to moving and is NOT permanent. NO STONES WERE HURT IN THE PROCESS OF THIS DIY. If you choose to recreate this for your rental or home, please practice safety first and I am not responsible for any mishaps that may occur. 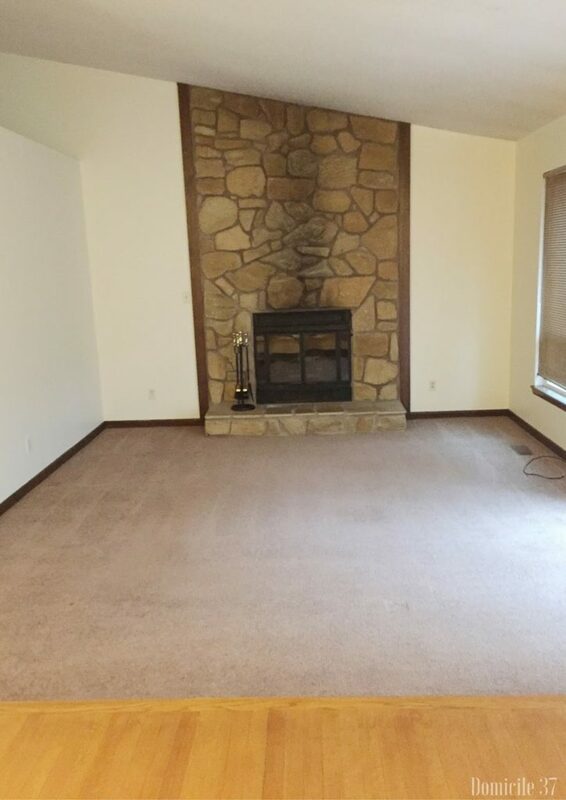 Also, this fireplace is purely DECORATIVE. We do NOT use it and have no intention on using it. 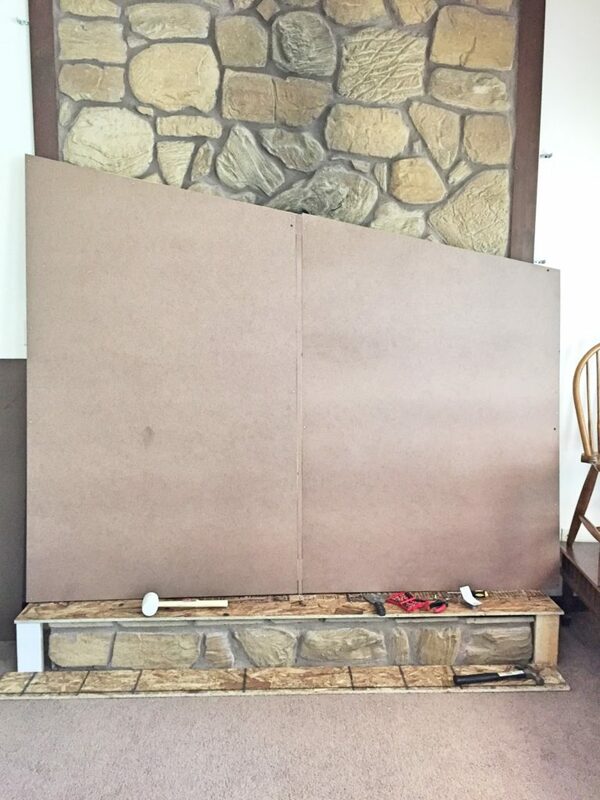 This faux fireplace facade is created in two parts, a base and a top part that follows the slope of the ceiling. Due to this being a temporary fixture there are two noticeable seams in the finished product. I framed out the base of the fireplace with 2×4’s and OSB wood. I covered the OSB with hardboard to give it a smooth finish. 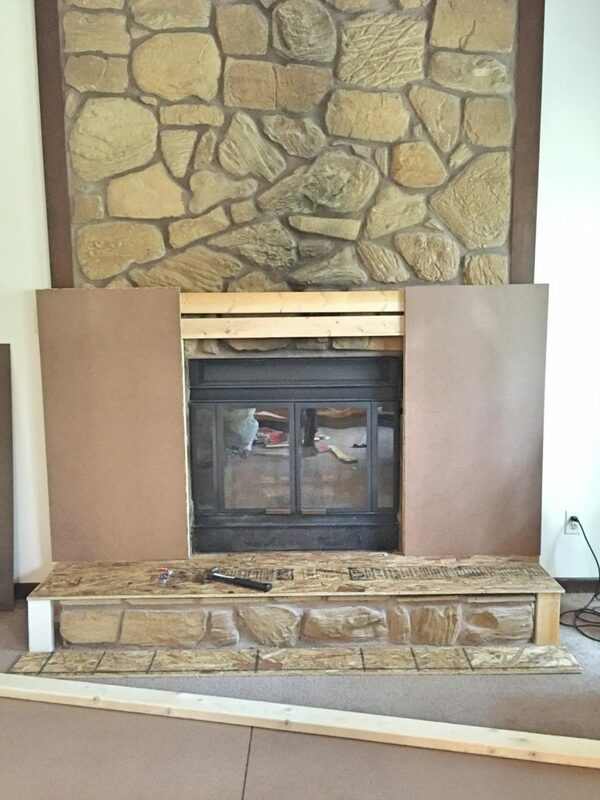 The base of this fireplace is definitely a bit heavier than the top part of the fireplace due to the fact that it will need to support the mantel. I attached the base and top with L-brackets. They do hit a stud and everything fits very snug. I framed out the top of my base the same way I did in THIS post. The top part of of this fireplace is light in weight and I framed it using 2×4’s. 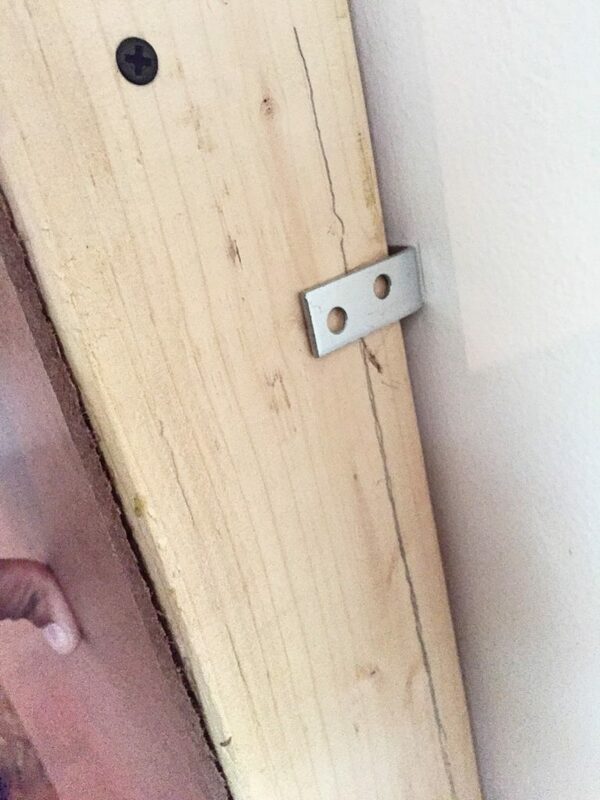 I nailed hardboard to the frame to act as my “drywall” and create a smooth finish. I really needed this piece to be lightweight, so that it is easy to dismantle and in case of an accident occurs. The screws and middle seams were spackled and sanded. Like I stated earlier, I have two visible seams on each side of the mantle to make for an easy dismantle. I used THIS tutorial to attach the mantel. 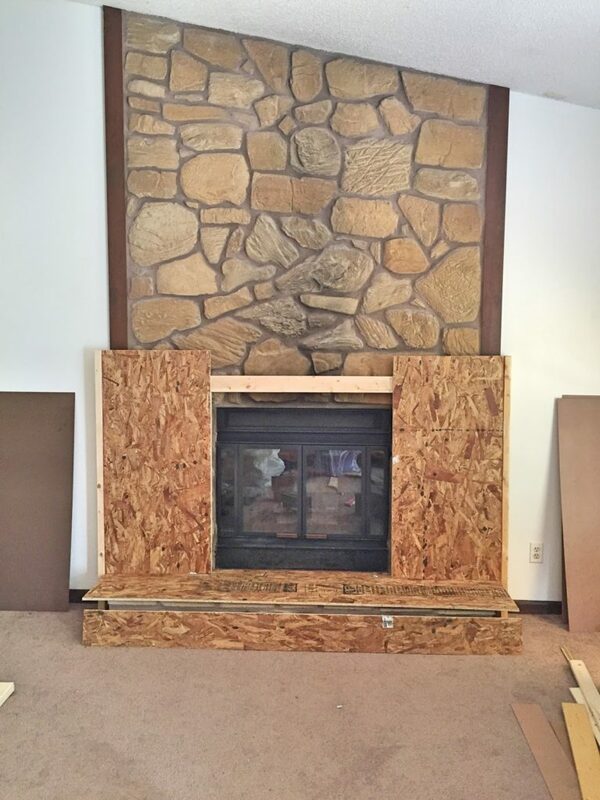 what you do not see in any of these photos is the hearth of the fireplace is finished using OSB. I really love the texture of OSB and it looks really pretty painted. It adds another dimension from the modern, sleek, outline of the fireplace. 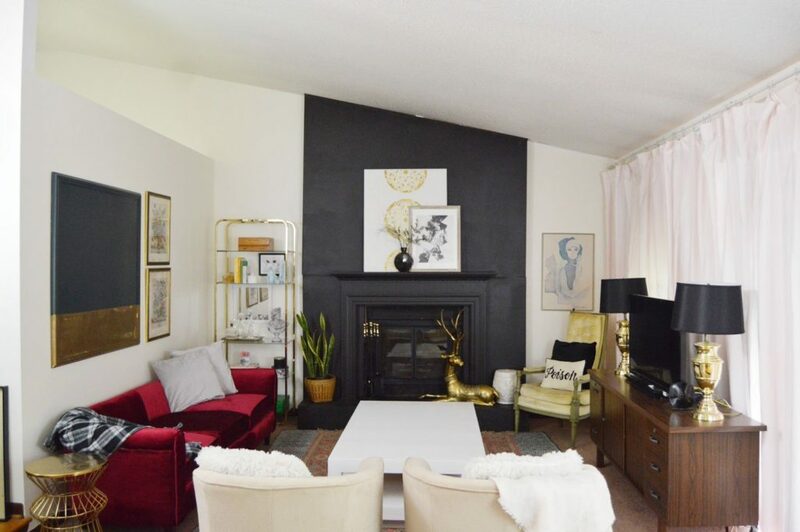 I wanted a mix-modern look to the fireplace and I think I achieved it. Well, that is all I have for you today! This project took me approximately one week to complete. 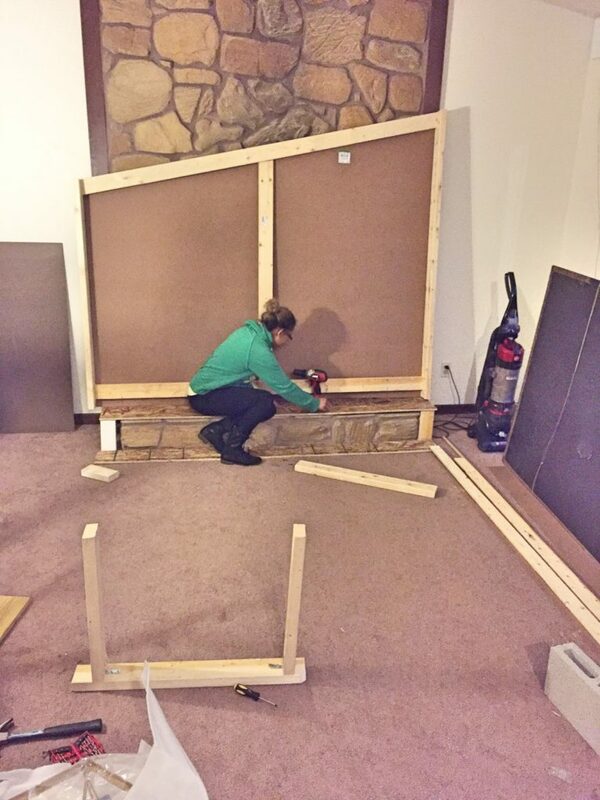 I did 97% of it on my own…I only needed help raising it and painting near the ceiling. This fireplace turned out better than I could have ever imagined. Since I live in a rental I do not have many tools, due to storage issues. I used a drill, saw, hammer, miter saw, wood screws, finish nails, and L-brackets to complete this project. 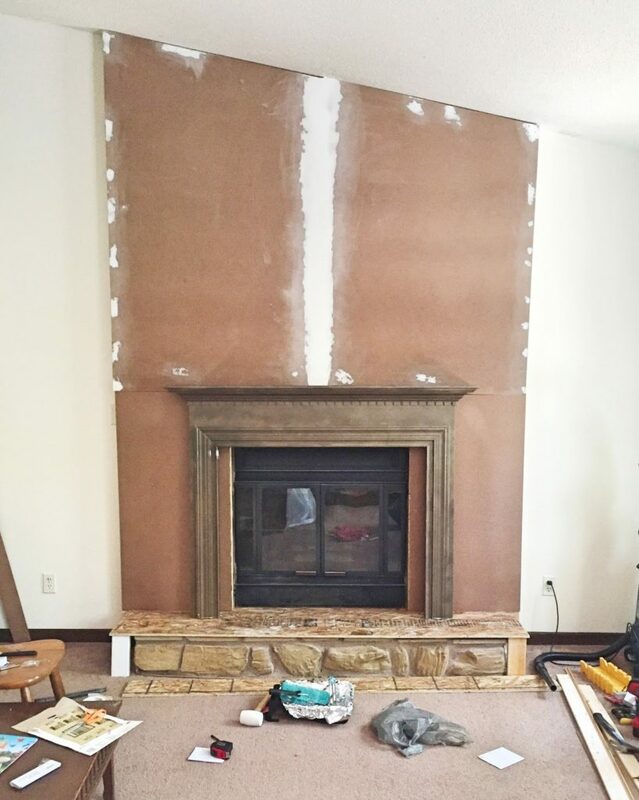 I spent approximately a whopping $150 on this project, mantel included. Thank you to the companies who have collaborated with me on this challenge, I appreciate it and feel so honored to work alongside you. What an improvement! I have some brick on my rental fireplace I'd love to paint but I don't think they'd allow it. Wish something like this would work for mine. Great job! wow! I did not know you rent. DIYing in a rental can definitely be challenging. I love it because this is where I can be creative, but then I hate it because I am limited on what I can do. Wow! 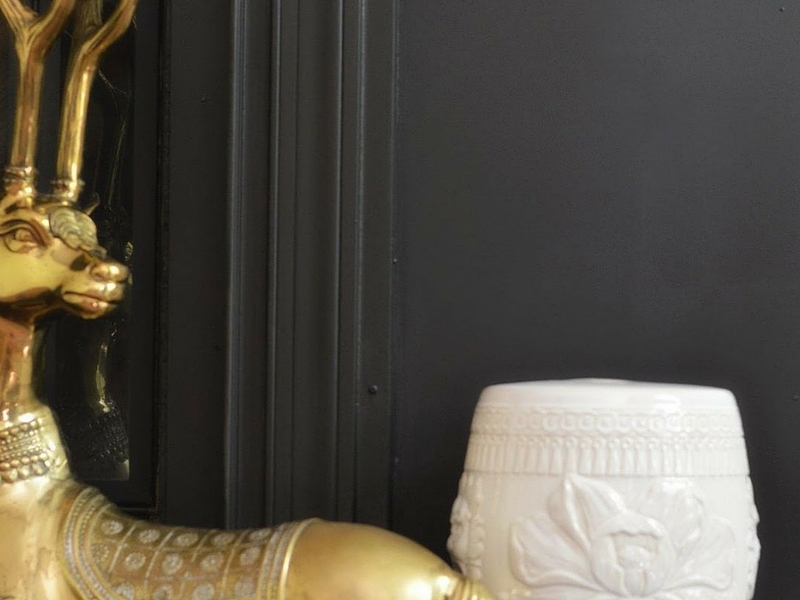 I LOVE what you did with this fireplace!!! I can't wait to see it painted…! 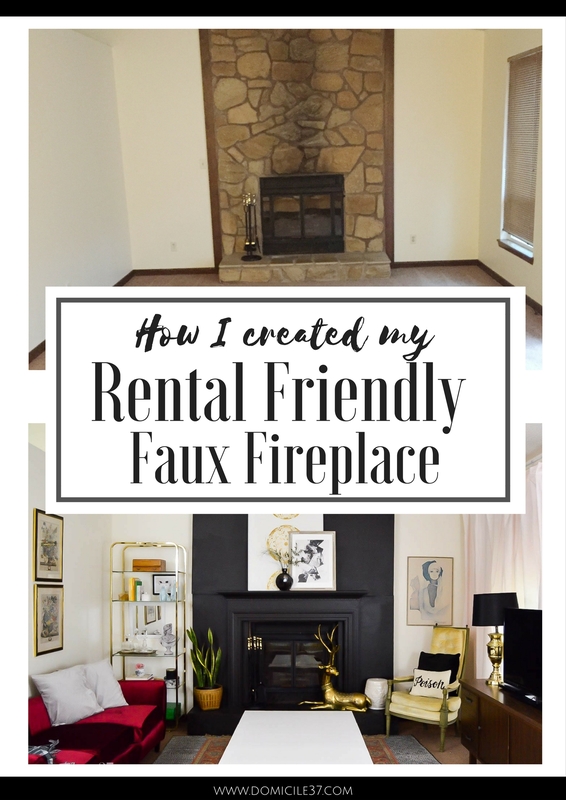 Wow, what an awesome way to update a rental fireplace! I can NOT wait to see it finished. You are amazing my friend! That's such an improvement to what's permanent. The owners should be thrilled that you are doing this. We'd love it if you'd join us at Thoughts of Home on Thursday and share this with our readers. I can already tell that I'm going to LOVE this! Can't wait to see. Wow! That's amazing! I love it Jess, can't wait to see more! oh i am dying to see this finished! you are so clever! This is going to make such a huge difference in the feel of your room. I can't wait to see how it all turns out! This is an incredible change! Can't wait to see the finished room- brilliant! OMG, get out!!!! I just assumed you painted your fireplace from the picture I saw on Instagram… You are awesome and so brilliant!!! haha…no. I HAD to do something. I did not have anything to match that stone. I will not even pretend, I absolutely positively did not like it!!!! I am in love with your blog, there are so many blogs out there, especially in our group and sometimes one gets away! I am so happy you stopped by my post for the OCR! I need to subscribe so i get it in my mail. 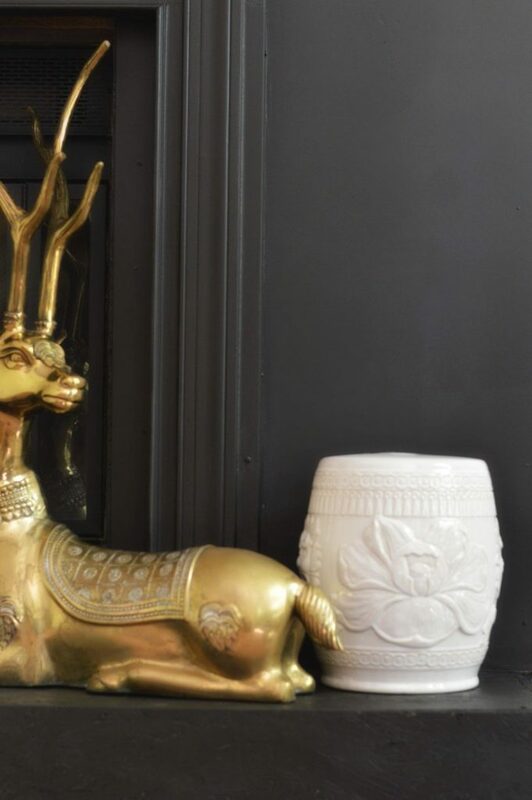 I love the Faux fireplace facade.The gold Goat or raindeer is beautiful. Oh wow! Such a great idea and well worth the $150! Can't wait to see how it looks all finished. WOW…that transformation is amazing! What a genius way to transform a rental space! Great jOb! Girl POWER. Looking gorgeous. Looks awesome! You are so clever AND handy! Go girl! This is incredible. First, that you came up with this amazing idea, and, second, that you did it almost all by yourself. I wonder what your landlord thinks of it. I love this. This has got to be one of the most dramatic before and afters I’ve ever seen! I’m picking my jaw up off the floor now….wow!